When it comes to MDI systems, the chain extender of choice for most processors is 1,4-Butanediol (BDO). Even though BDO possesses good physical properties and an easy liquid form, its higher freezing point, hygroscopic character, and regulative control may leave processors wondering if there are other chain extender alternatives. What many manufacturers may not realize is that 2-Methyl-1,3-propanediol (MPO) is a viable substitute for BDO. Not controlled by regulations and even used in cosmetics, MPO is a user-friendly diol compared to BDO. In addition to this benefit, MPO demonstrates a unique performance at low temperature, hydrolytic stability, a less hygroscopic character, an extremely low freezing point at -54℃, and other qualities that make it easy to use in MDI systems. What properties can you expect from MPO? Please see the comparison with BDO in the following chart. Note the hardness, rebound, tensile, and tear characteristics of both chain extenders. BDO has a higher freezing point and becomes viscous at a lower temperature, which can create extra expenses for logistics, storage, and processing. In contrast, MPO remains a liquid unless you are in Alaska and does not need to be kept warm in normal conditions. Not only does this aid processors operating in cold weather, but it can also benefit companies looking to decrease storage and handling costs necessitated by heated lines and other precautions. 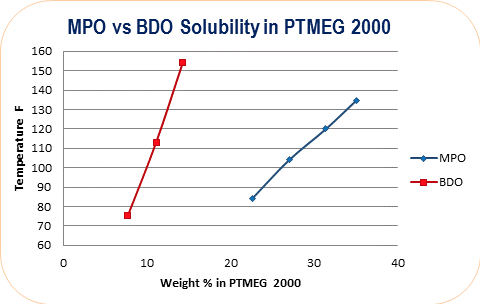 Another important contrast between BDO and MPO is the latter’s reactivity. 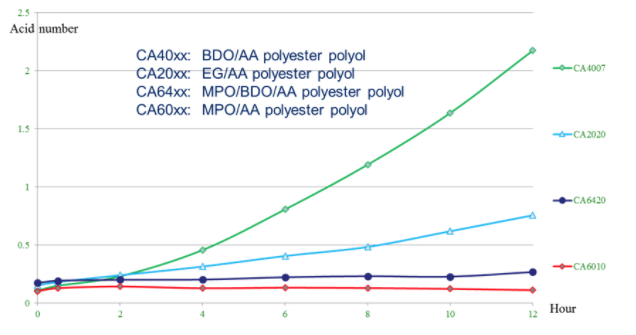 If you compare the two chain extenders, you’ll find that MPO reacts faster than BDO in forming polyester polyol and reacts at lower temperatures. In addition to improving processing times and decreasing the amount of energy needed, this trait is useful for manufacturers who are concerned about the color of their applications. It’s yet another way MPO ranks highly on the list of small molecule diols, not only BDO, but also EG, DEG, PG, NPG, etc. Contact us for more information on this part. BDO is known for its hygroscopic nature. Leave BDO exposed, and it will soon collect moisture from the air and begin to become heavier. 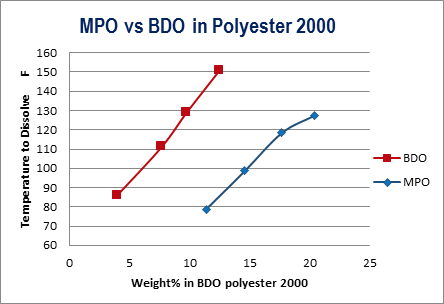 Unlike BDO, MPO demonstrates a markedly decreased ability to pick up moisture during use. This can lessen the burden of the storage difficulties associated with BDO and can also lessen the likelihood of defects in your finished products. The contrast between BDO and MPO is quite significant when it comes to hydrolysis resistance brought into the cured polyurethane parts. In Gantrade’s research, both a MPO polyol and BDO polyol were tested at elevated temperatures. Evaluating hydrolysis after heating the polyols with 10% water to 90℃ revealed that the BDO adipate experienced an exponential growth in the speed of hydrolysis. However, the MPO adipate showed very little change. For organizations producing marine environment products or materials for outdoor gear, this durability is an important benefit. As an additional advantage, MPO also gives polyurethane materials a high abrasion resistance. BDO can be less than cooperative in multicomponent mixtures. 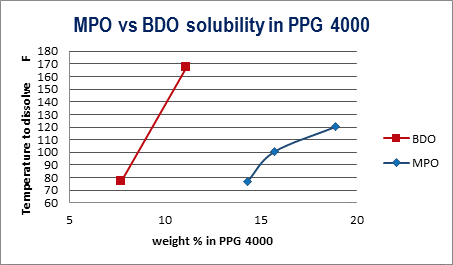 Tests on three different polyols (PPG polyols, PTMEG 2000, and polyester polyol 2000) revealed that BDO creates significant separation issues. In contrast, MPO has a much wider range for maintaining homogeneity, and it offers the ability to successfully blend with other chemicals. This compatibility and improved stability means you’ll avoid off-ratio quality problems that lead to defects and production issues that raise your costs. For softer polyurethane applications, such as fabric coatings, paddings, and spray coatings, MPO also displays versatility as a substitute for BDO. If you’re a polyurethane processor who meets consumer demands for smooth and plush products, you’ll appreciate how MPO can stand in BDO’s place as a chain extender. From decreasing your storage expenses to increasing the hydrolytic stability of your applications, MPO is a chain extender that’s able to provide a significant improvement in processing and performance qualities. Partner with Gantrade, and gain expertise on the best products for your polyurethane manufacturing—whether you need BDO, MPO, or another polyurethane intermediate. Contact Gantrade today.